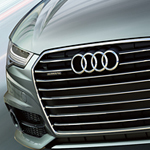 With top safety ratings and strong performance, the Audi A6 offers safety and driving enjoyment. The 2018 Audi A6 received a 5-Star safety rating from the National Highway Traffic Safety Association and comes equipped with advanced technology designed to keep you driving in luxury and safety. The vehicle's advanced technology options include a heads-up display and a "write on" touchscreen. Audi's heads-up display enhances safety by giving you critical driving information including speed and navigation instructions directly on your windscreen. MMI touch navigation allows you to "write" any destination, contact number, or radio preset smoothly. The MMI system can be completely personalized for the greatest ease, comfort, and safety. Explore your technology options with the Audi A6. Our qualified staff at Audi Birmingham are eager to discuss the advanced technology in the Audi A6 and offer you a test drive.